The Tufts University Jumbos Women’s Soccer Two-Day Clinic will cover both the technical and tactical aspects of the game. It is intended for female soccer players entering grade 10 to grade 12 who are aspiring to play at the college level. The camp is going to immerse the participants in the tactics and strategies in college playing field. Furthermore, this soccer camp will be under the supervision of the Tufts University Jumbos women’s soccer coaching staff. It is going to fall on July 1 and July 2 at the state of the art Kraft Field which is on the Tufts University campus. The registration fee includes lunch and a camp t-shirt. Tufts University, formerly Tufts College, is a private, coeducational, nonprofit, research university in Medford, Massachusetts. Its name is in honor of Charles Tufts, a notable American philanthropist. It is an affiliation of the Association of Independent Colleges and Universities (AICUM) in Massachusetts. The university is also a member of the Universities Research Association (URA), the National Association of Independent Colleges and Universities (NAICU) and the University Press of New England. In addition, Tufts University has also additional campuses in Boston, Grafton, and Talloires, Massachusetts. Currently, the university is serving around 5,200 undergraduate students and around 5,400 postgraduate students. Moreover, in the 2018 US News and World Reports Best Colleges rankings, Tufts University is at top 29 in the National Universities category. It is also top 25 in Best Value Schools. In athletics, the university is participating in the New England Small College Athletic Conference (NESCAC) of the National Collegiate Athletic Association (NCAA) Division III as the Jumbos. Their identity colors are Tufts blue and brown. 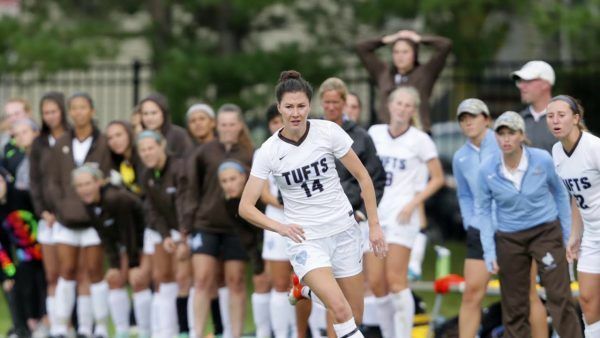 Head Coach Martha Whiting is leading the Tufts University Jumbos women’s soccer team. She is now in her 19th year at the reins of the Jumbos women’s soccer program. Coach Martha Whiting, an alumna of Tufts University is a National Soccer Coaches Association of America (NSCAA) National and Advanced Diploma holder. Ultimately, Coach Whiting is the 2000 NSCAA Division III National Coach of the Year awardee. She is also a three-time NESCAC Coach of the Year. Under her guidance, the Jumbos women’s soccer team has already two NESCAC Championships and four NCAA Tournament appearances. She is now holding an overall coaching win-loss record of 165-92-34. Then, the Tufts University Jumbos women’s soccer assistant coaches are Julia Rafferty, Madeline Buckley, and Daniel Ford-Hunt. Coach Julia Rafferty, a native of Reading, Massachusetts is now in her third season with the coaching staff. At the same time, she is the Jumbos’ recruiting coordinator. Coach Rafferty is a Bates College graduate and was a former college soccer stand-out. In fact, she is the 2012 Team Most Valuable Player. Coach Madeline Buckley is the newest addition to the Tufts Jumbos women’s soccer coaching staff. She is a bachelor’s degree in Critical Social Science graduate from William Smith College. Coach Buckley is a former Liberty League Player of the Year and the ECAC Upstate Offensive Player of the Year awardee. Finally, Coach Dan Ford-Hunt, an alumnus of Daniel Webster College is a USSF “D” License and an NSCAA National Goalkeeping License holder. Join the Tufts University Jumbos Women's Soccer Two-Day Clinic. It will fall on July 1 and 2 at the leading-edge Kraft Field in Somerville, Massachusetts. This is an identification camp that is open to all female soccer players entering grade 10 up to grade 12. The training program is set to start at 8:30 AM on Day 1 and end at 3:00 PM on Day 2.